Preheat the oven to 375°F. Sprinkle the chicken with salt and freshly ground black pepper. 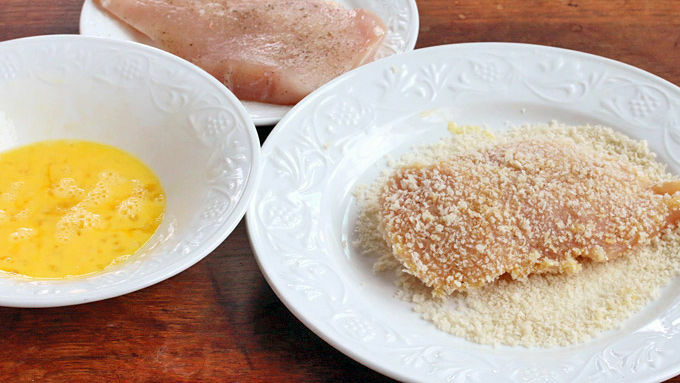 Dip each cutlet into the beaten egg and then thoroughly coat them in the breadcrumb/Parmesan mixture. Lay the breaded chicken on a lined cookie sheet in a baking dish and bake for 20-25 minutes or until the chicken is done and golden. Get the balsamic reduction going. 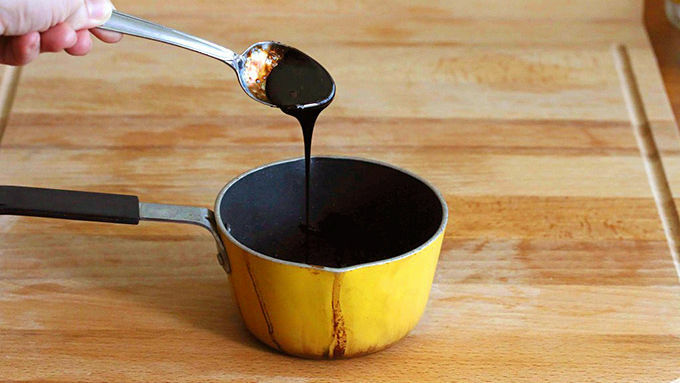 Pour the balsamic vinegar into a small saucepan and bring to a boil. Reduce the heat to a low simmer and, stirring occasionally, simmer the vinegar until the quantity has reduced by about half and the vinegar coats the back of a spoon. Be careful not to overcook or it will harden like stiff taffy. While the chicken is baking, prepare the risotto. 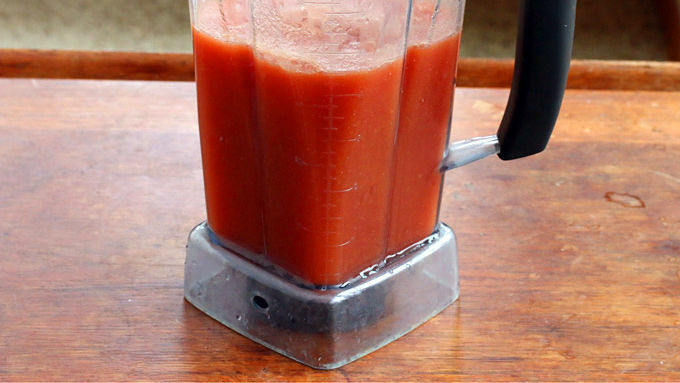 First place the broth, salt and fire-roasted tomatoes in a blender and blend until smooth. Place in a stockpot and heat until hot. Keep it hot. Heat the oil in a medium saucepan (preferably deep, but narrow in diameter) over medium-high heat and cook the onions until soft and translucent, 5-7 minutes. Add the garlic and cook for another minute. Add the rice and seasonings, stir and cook for 1 minute. Add about 1/4 of the hot tomato broth. Cook, stirring regularly, until most of the liquid has evaporated, then add another 1/4 of the broth. Continue adding the broth 1/4 at a time, regularly stirring while the rice absorbs the liquid. The rice will begin to swell and become somewhat creamy in texture. The process will take 20-25 minutes. Add mozzarella and stir until melted. Add salt and pepper to taste. To serve, portion out the risotto into large, wide bowls and drizzle with some balsamic reduction. Place a chicken breast on top and sprinkle with chopped fresh basil and shredded Parmesan cheese. 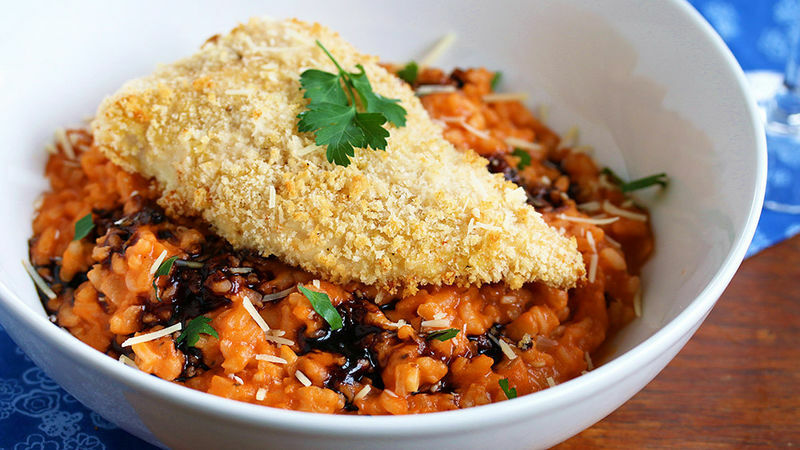 This dish proves that risotto is not so difficult to make and totally delicious. 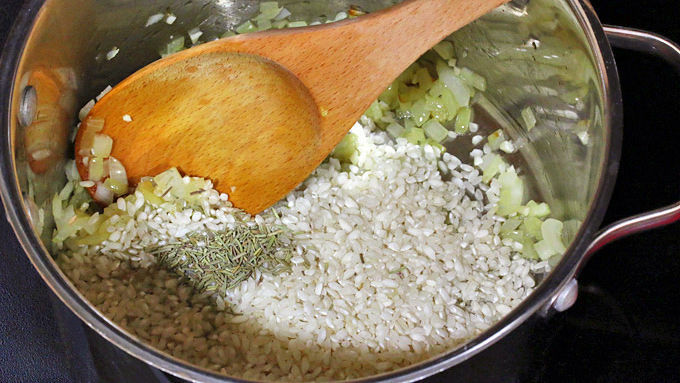 Making risotto is a kind of culinary art unto its own. 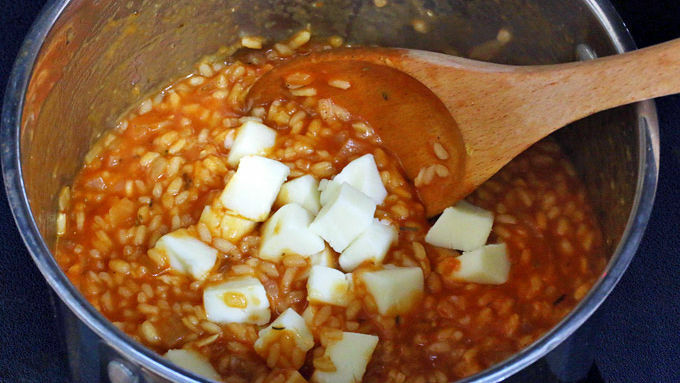 Using a special kind of rice (most commonly Arborio), it cooks up nice and creamy with a delightful bit of chewiness to it. You can find entire cookbooks devoted just to risotto. Clearly it has a very devoted following! Risotto tends to have an upscale connotation, but it’s really very simple to make – it just requires you to follow a particular method, which we’ll demonstrate today. Here's a delicious risotto dish that looks and tastes gourmet but is easy to prepare. The risotto is cooked in broth combined with pureed fire-roasted tomatoes for a wonderful smoky edge. It’s then drizzled with a simple sweet and tangy balsamic reduction and topped with super easy baked crispy chicken. It’s all easy to prepare but there are multiple layers of flavor and texture going on here. And it’s those different layers that make a dish not only delicious but also interesting as you explore each layer. You’ll be congratulating yourself by the time dinner’s over, and so will your guests!